The City of Copenhagen is currently planning to expand the existing, extensive network of bike lanes to extend farther out into the suburbs. A network of 13 high-class routes - 'bicycle superhighways' if you will - dedicated to bicycle commuters and aimed at encouraging more to cycle to work. Currently 37% ride to work or school in Copenhagen. While in many other countries anybody who cycles to work is often considered a 'bicycle commuter', most of the 500,000 people who cycle to work or education in Copenhagen don't fit into the Danish version of this statistical category. A 'commuter' is loosely categorised as someone who travels more than 10 km to work. The City of Copenhagen and the surrounding towns are aiming to increase the trips by bike on the new routes. There is an efficient network of public transport throughout the region but just as any train passenger or motorist knows, it feels much quicker and is much quicker if you don't have to stop all the time. The same principle applies to cycling to work and it is the key to the development of this new net of superhighways. Just like anywhere, there are many people who cycle longer distances but the focus for the new plan is the 'middle ground' - the zone between 7 and 15 km from the city centre. There are roughly 100,000 people who currently commute into or out of Copenhagen County [as opposed to within], travelling between 4-15 km. 15,000 of them ride their bicycle. The remaining 85,000 who take the bus, train or car are the target group for this project. - Smooth, even surfaces free of leaves, ice and snow. - As direct as possible with no detours. - Homogenous visual expression, for example, with signage and the trademark blue bike lanes through larger intersections. - 'Service stations' with air and tools along the routes. - Possibility to maintain a high speed and with sufficient width to overtake other cyclists. - Safe and quick crossing priority for cyclists when they approach cross streets. The new commuter routes are expected to cost roughly 250 million kroner [$47 million]. 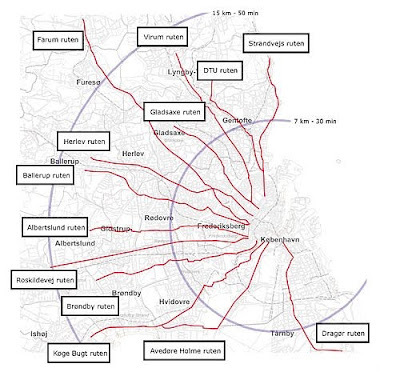 A net of routes of similar length, isolated and away from the streets would cost between 1 and 1.5 billion kroner. [$200-280 million]. The City of Aarhus is working on a similar project.